When it comes to Valentine's Day gift ideas, there is always one sure bet for the lady in your life...CHOCOLATE!! Show me a regular candy bar and I wouldn't bat an eyelash but show me truffles and I am your best friend. When Premium Chocolatiers sent me an email about their Valentine's Day chocolates, I had to wipe the drool off of my keyboard. It takes a lot to get to me like that because I don't have a penchant for sweets but my intuition was flashing and now, once I have tasted them, all I can say is WOW! When the box arrived I couldn't tear it open fast enough. I was captivated by the pink and brown (in my opinion, the best color combination!) and I was nice enough to wait until I could open it with Dexter. You see, he saw the email that I got and the pictures of the chocolates and he was, I think, more excited to try them that I was. Fast forward to our dessert time. You know dessert time, right? Thats the moment, right after dinner when the kids are begging for a treat. I went to the kitchen, poured a glass of Cabernet for myself and grabbed the gorgeous box of treats. Nothing goes better with chocolate than a nice glass of red wine....nothing! Now that I have your attention, lets discuss the truffle flavors. From left to right you have: Milk Fudge, Raspberry Truffle, Salted Caramel, Grand Marnier and Coffee Truffle. Forward to Dexter begging for the Milk Fudge which I happily fork over. I chose the Salted Caramel for myself, Raspberry Truffle for Oliver and Coffee Truffle for Jason. Of course, it wouldn't be fair for my review if I didn't nibble on each piece first however. I will tell you that they are all amazingly rich and decadent. I was really in heaven with this box. I may have to hide the rest so no one can find them. My absolute favorite was the Salted Caramel. It was almost like a salty chocolate coated carmel brownie. Yes, that good. I also absolutely loved the Coffee Truffle. Jason adored the Coffee Truffles and that is saying a lot since he is not much of a sweets guy either. All of these truffles were amazing with the red wine, which enhances the chocolate experience. Don't believe me, try it for yourself. You can thank me later. 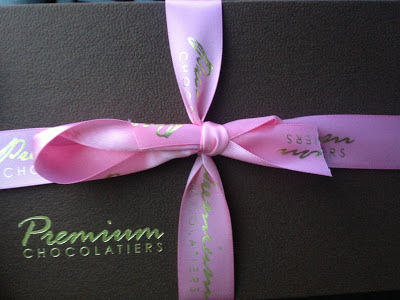 I have to admit that I liked each of the truffles although I am not very keen with fruity chocolates. I just don't get it. I like a chocolate covered strawberries but thats about where I draw the line. Lucky for me, the kids will never turn down a piece of chocolate and they loved the Raspberry Truffles. Win-win. One thing I forgot to mention, which you aren't going to believe is that these are VEGAN truffles. I simply couldn't believe that they are egg-free, dairy-free, nut-free and gluten-free. WOW! Now I can have my chocolates and eat them too. *I was given a box of truffles in exchange for my honest review. I was not obligated to write a positive review. All opinions are 100% my own. I would probably say Milk Chocolate!! They all look soo yummy! I'd love to try the Valentines Pretzel Heart. Love chocolate covered pretzels. Yum!! I'm doing my best trying not to lick the screen! Those truffles look so good...the cheesecake bites and strawberry cream ones look so good too! I'd love to try one of everything from that place! YUUUUMMMMMMMMMMM! I'm doing my best not to lick the screen. I LOVE truffles and all the flavors especially coffee sound sooo good! All the goodies from that website look so good such as the cheesecake one and strawberry cream. I'd love to try one of everything from there! Anything except coconut is good for me!! I would like to try the grand marnier truffles. They all look and sound delicious. I would probably like the salted caramel one the best, too. What is a "peanut like filling" made out of, I'm wondering? The Love Frog! He is really cute. I would like to try the White Fudge Hearts! I would like to try the chocolate monkeys. They are so cute! YUM! I'd like to try the salted caramel truffles! Their chocolate bouquets are also cute!! Oh my gosh, that Hungry Monkey is so cute! It looks tasty too... it makes me hungry! The Valentine Peanut Butter Hearts look very good and delicious. I would love to try them also. I would love to try the heart shaped chocolate covered pretzels. I'd also love to try the Strawberry Creams! I would loooove to try the chocolate cheesecakes. They sound awesome! I would like to try the coffee truffles. Well you had me at a dozen long stem chocolate roses! I would like to try the premium dark semi sweet bars. The chocolate cheesecakes look delicious!!!! the chocolate cheesecake and peanot butter cups!! I would like to try the Valentine Chocolate Covered Pretzels. Signature Truffle Collection (15 pieces. Chocolate Cheesecake or the chocolate roses. I want to try the Chocolate Covered Pretzels! I also like the Long Stem Chocolate Roses! I would love the Chocolate Covered Pretzels (Gluten Free Semisweet)! The perfect combo ~ dark choc & salty pretzels! The milk fudge truffles sound great! I'd like to try the Raspberry Truffles. Like to try the Chocolate Cheesecakes! The white fudge hearts look delicious. Thanks for the chance. The white milkless hearts box! And the cheesecakes. And the truffle combo box. And the salted caramel truffles!!!! The chocolate cheesecakes oh my yum! I want to try the Chocolate Covered Pretzels (Gluten Free Milkless). I'd love to try the Combo Bar Pack. I'd like to try the chocolate carmel truffles. The Fancy Pretzel Tray! I've been dying to try vegan chocolate covered pretzels! The cheesecake chocolates sound yummy too! I'd like to try the Love Frog chocolate. Heart Lolly made from finest creamy signature Milkless Chocolate. i would like to try the Salted Caramel Truffle! I want to try the Heart Truffle Box. I want to try the Truffle Heart Box. Raspberry Truffles sound absolutely divine!! I want to try the chocolate cheesecakes. I would love to try the Snowmen, except they're just too cute!